As most food bloggers and passionate home cooks do, I long to host Thanksgiving. It is the ultimate foodie holiday, plus its such a fun time to gather together with friends, family, and loved ones. I'm lucky enough to have 3 different Thanksgiving dinners to choose from each year, but part of of me definitely wishes I could be the one hosting. I think it would be a lot of fun to flex my culinary muscles and try out new and challenging recipes. I was discussing this with Joey the other night, and we decided to just have our own mini Thanksgiving over the weekend. I could make the recipes I want, versus what is traditional and expected in my family - and in the process we formed our own traditions. I wanted the dinner to have traditional elements but with upscale twists. I really am pleased with how everything came together. I didn't feel the need or desire to roast an entire turkey, plus I've been wanting to make this roulade for quite some time. I absolutely LOVE dressing, and while I've never eaten it from the cavity of a bird, I do like the idea of making a roulade with it. I had a heck of a time finding someone to debone and butterfly the turkey breast for me. Yes, I realize I could do it myself, but I have a tiny kitchen, a busy weekend, and really no desire to hack a turkey breast to pieces. We are actually about 5 miles from 2 seperate butchers, but neither one offered "that service." Go figure - a butcher that doesn't butcher. Luckily, I also live close to a Whole Foods, and they were more than happy to do it for me. Once you have your turkey boned and butterflied, this is pretty easy to prepare. The stuffing is a pretty standard mix with some dried fruit thrown in for extra flavor, and then its just a matter of rolling it up and tying the roast. I was kind of nervous to do this, but it wasn't a big deal at all. I did end up losing quite a bit of stuffing as I rolled up the roulade, but it was no big deal. The turkey breast cooks in under 2 hours, and you're left with a juicy roast with yummy stuffing inside. And as a bonus, there is plenty of stuffing left to bake up and serve on the side. Check back tomorrow, I'm going to do a turkey round-up just in time for the big day! Place the dried figs and cranberries in a small saucepan and cover with the Brandy and 1/2 cup water. Bring to a boil over medium heat, then reduce heat and simmer 2 minutes. Remove from heat and set aside. Meanwhile, melt the butter in a large skillet over medium heat. Add the onions and celery and cook until softened, about 5 minutes. Add the sausage, and break up large chunks with the back of a wooden spoon. Cook, stirring often for 10 minutes, until it is cooked through and browned. Add the figs and cranberries with their liquid and the rosemary, and cook 2 more minutes, scraping up the browned bits with a spoon. Place the stuffing in a large bowl. Add the sausage mixture, chicken stock, egg, 1 teaspoon of salt, and 1/2 teaspoon of pepper. Stir well to combine. At this point the stuffing can be refrigerated overnight, or used immediately. Preheat the oven to 325 degrees. Place a baking rack on a sheet pan, or prepare a roasted pan with its rack. Lay the butterflied turkey breast skin-side down on a clean cutting board. Sprinkle the meat with 1 1/2 teaspoons of kosher salt and 1 teaspoon of pepper. Spread the stuffing in a 1/2 inch thick layer over the meat, leaving a half-inch border on all sides. Don't mound the stuffing or the turkey will be difficult to roll. Set the leftover stuffing aside. Starting at the short end, roll the turkey like a jelly roll and tuck any escape stuffing back in the sides. 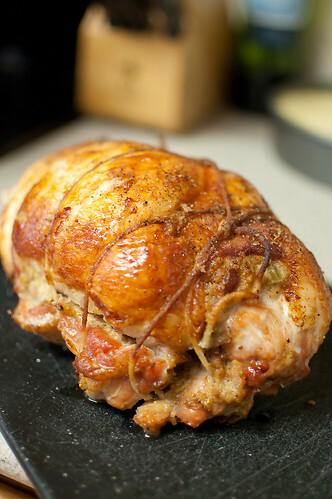 Lay the turkey seam-side down, and tie firmly with kitchen twine at 2 inch intervals to make a compact cylinder. Transfer the roulade to the baking pan, and brush with melted butter. Sprnkle with additional salt and pepper, and roast 1 1/2-2 hours, until a thermometer reads 150 degrees in the center (test in a few places to be sure). Meanwhile, pour the leftover stuffing in a buttered dish and bake alongside the turkey for the last 45 minutes of roasting. Remove from oven and cover with foil to rest for 15 minutes. 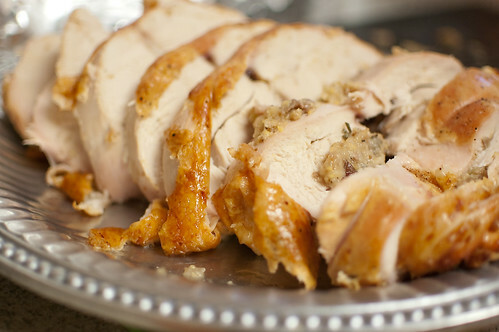 Carve 1/2-inch thick slices and serve warm with the extra stuffing (and gravy, if desired). i also want to host a thanksgiving dinner one day! it would definitely be a challenge, but so much fun too! I made this turkey roulade last year and Whole Foods did debone for me too! They had to do it twice though...first time they took off all the skin. It's another great recipe from Ina to be sure!! Happy Thanksgiving. Love this recipe! I will definetly have this on my must cook list for Christmas!